Perfect for reading with one hand, which is great for commuting, reading standing up, drinking while reading or just about anything. Also, when you're done reading, just place the Thumb Thing sideways in the book as a bookmark. Very simple yet very cool. 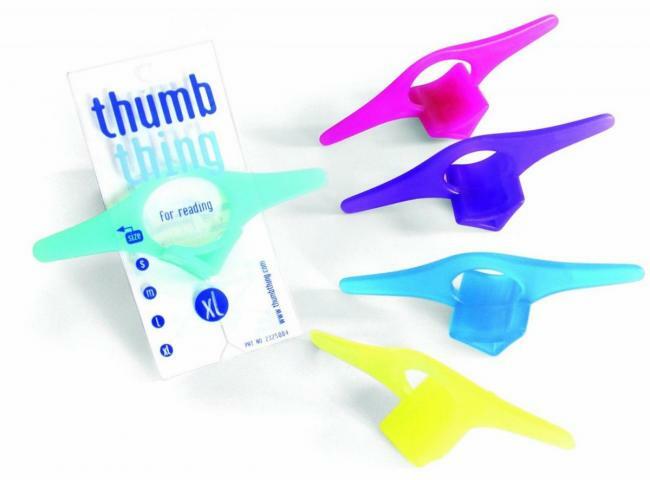 Thumb Things come in (thumb hole) size: small (1/2), medium (5/8), large (6/8) and extra-large (7/8). Small Thumb Thing should fit fingers with ring sizes of 3 to 6.5, Medium Thumb Thing - ring sizes 7 to 8.5, Large Thumb Thing - ring sizes 9 to 11.5 and Extra-Large Thumb Thing - ring sizes 12 and up. Thumb-Things color may vary.